I don't know if many people are using the "Go Directly To" menu - I don't, but nevertheless the menu should be correct. It still shows "Oracle Developer Community", which is obsolete and should read "Groundbreakers Community". Speaking of which, the menu might look more professional by removing unnecessary words, like "Community", which only blows up the menu for no good reason. Who's brilliant idea was it hide to the Actions menu? It took me several seconds trying to figure out how to create a discussion. I suppose anyone not familiar with the interface and not knowing that there "must" be an option may simply conclude this is not the place to post questions. It's not a good design. Also, black text on blue is not a good option for text for reasons of contrast. I'm not a web designer, but it's just common wisdom. I think the banner also looks messy with all the different styles, colors and typefaces. I find the same with some of the 'We have moved' pages when OTN groundbreaker pages have been moved - and I suspect others do too as recently there was a post for BI Publisher on the OBIEE forum, when I came to tell the poster where they needed to be I found the 'We have moved' which is not remotely helpful as finding the new site is far from obvious, I feel that elements like this and the non-obvious buttons are a causal factor contributing to the decline of the forums! Expecting Actions next to Facebook and Twitter when people are probably looking for words like Post or Create is not helpful. A graphical web interface should show the options available and not hide them in menus. Similarly, people look out for product names and appropriate forums to choose from. The current hamburger menu does not even remotely suggest that this is where to find product/user forums. Why, for example, would anyone move the mouse to "Groundbreakers" in order to find a database forum? I don't understand the rationale, but perhaps that is what Oracle wants to accomplish. No, you have to think positive - Oracle wouldn't want to do that! It's just to make people like me or us wonder. The answer is perhaps due to inexperience or not too much thought about it. Btw - thanks from those of us who are colour blind for labelling the axis of your colour chart - if only London underground can realise that they exclude 10% of the male population. How many times, at how may websites (not just Oracle) have I desperately wished that the site architect could just sit next to me and watch me try to navigate the mess he has created . . . 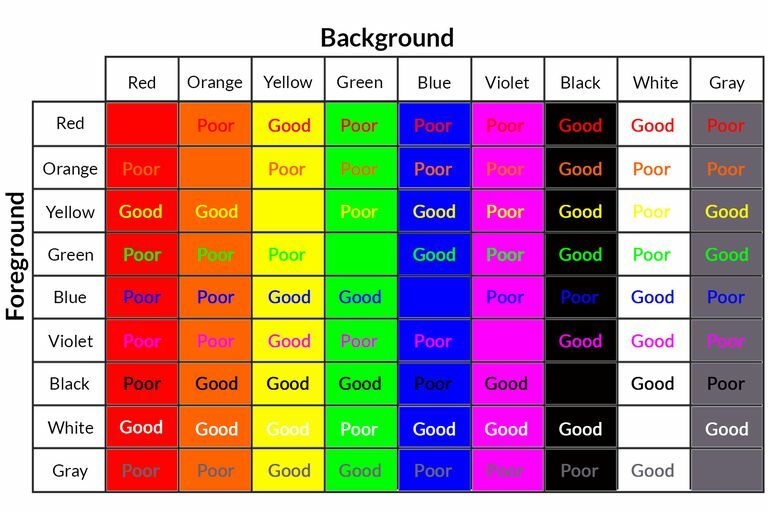 Interesting chart, although I disagree with white on yellow as being "Good"
LOL. it's so bad that the author probably wasn't even able to read/notice the error. Whatever the reason, circumstance, or scope, I guess the difficulty, as usual, will be to find someone who's able to row back and reconsider. Also, I can't tell if red on red is "Good" or "Poor" - it should be "Poor" since I can't read it.